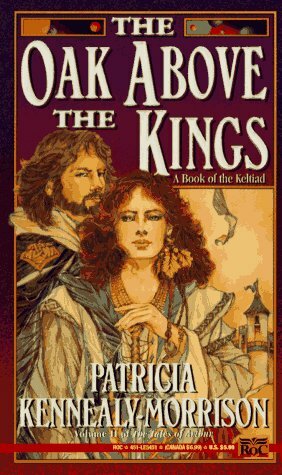 I thought I was getting too old for fantasy, until I found Patricia Kenneally's first trilogy of The Keltiad, an exciting mixture of space fiction and sword and sorcery. At the end of the third book we entered into Arthurian fiction and the second trilogy, of which this is the second book, takes us back in time in this alternate universe to tell us, through Taliesin's voice, the story of this alternate Arthur. I should confess, at this point, to being a fan of all things Arthurian.However, this is not a simple re-telling, Kenneally-Morrison, as she now is, has built a totally new universe in which to set the tale, built upon old Celtic and Druidic foundations and as deep and complex as anything I have read since first reading "Dune" over 45 years ago. She weaves into this underlying fabric many of the different strands of the legends but alters them to fit into her grand design. The language fits the story beautifully, almost Tolkienesque at times.I looked back and saw that I had only given the previous book 3 stars some nineteen months ago, but as I read this one, I recalled so much of the earlier book that I think I will need to revise my previous score.Having read the first 100 pages I hastened to the computer to find the next one. It has arrived and I will read it soon. I am really looking forward to it. Imagine Brendan fleeing from Ireland to find another world among the stars. Then imagine King Arthur & co. set in a planetary system instead of in England. Okay, it sounds a little corny when put that way, but it's really a good read, interesting characters, lots of Celtic lore. The only problem, I think, is that because it is a tale told by a bard, it is more told than shown. I wished for more direct contact with the characters instead of always being told about them. Even so, I do enjoy this series. Finished this book a long time ago. Again, the space opera take on the Arthurian epic was very original to me. Ms. Kennealy-Morrison gave us a great novel. I love this series so much I had to buy the hardcover edition of this book. I love Arthurian tales and when Morgan is good and powerful I love them even more! A great book in a great series! Although I enjoyed the first Keltiad trilogy, I couldn't finish this one.